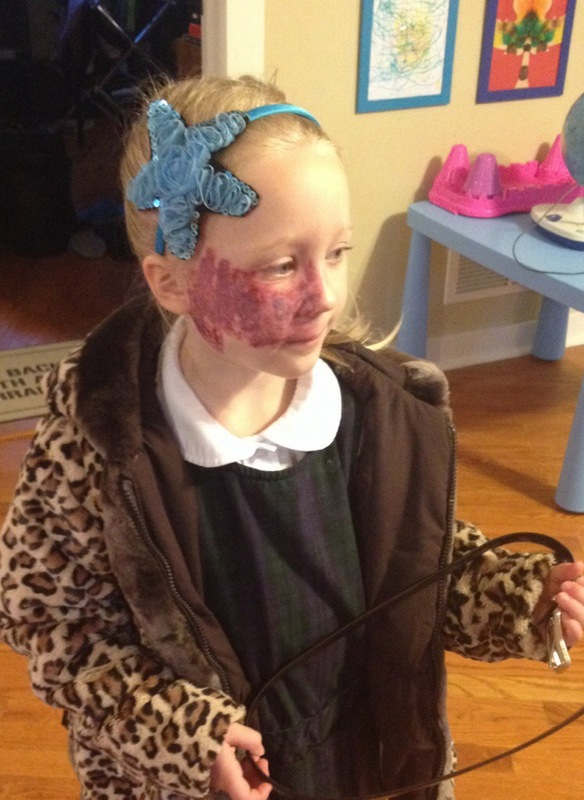 School | What Happened To Her Face? Three days after her latest laser surgery, Addy sang a solo in her school play while sporting the usual purple bruising that follows each treatment. Yesterday, Adelaide had her first laser surgery for her port wine stain since kindy (kindergarten) started. Jennica and I have been warned that kindergarten is when kids “become more aware” (polite code for “get nasty”) of port wine stains. Yes, my five-year old is now more responsible than I. Her second interaction was with Mikey (alias). Mikey stumbled down the hall to hang his coat up but stopped when Adelaide accosted him with a bombardment of words. He stood staring at her with the same ‘it’s-morning’ scowl that he had been wearing the whole time. Then Addy said, “Mikey, I look different today. Can’t you tell?” Mikey smiled, nodded, and they both laughed while he put his coat on the hook. Last week was our first experience sending Addy to Kindergarten with a purple face (bruised from Monday’s laser surgery). And we have heard from many (more experienced parents, teachers) that kindergarten is around that age when kids transition from cute little ‘Curious Preschoolers’ to largely self-aware and potentially cruel ‘Big Kids’. 1) Control the Big Picture: We’re sending her to the same little K-12 school she attended for preschool. Which means small classes (like, a dozen kids here), some familiar classmates, and similarly religious families, all of which help tilt the odds in favor of a kindly reception. It’s not foolproof, but I’d be more apprehensive launching her purple-faced into a kindergarten full of 30 young semi-strangers. 2) Talk to the Teacher: We spoke to the teacher, Mrs. K., a month or two ago to give her the heads-up that this would be coming. She (awesome lady!) offered to let Addy speak to the class in a sort of “Q&A session” to explain her bruising when it occurred. (A chance to be the star? Diva? Center stage? Yes, please!) That way, all the questions can be openly asked, the kids can get all the stares out of their system, and Addy’s in control while it happens. Brilliant woman, this teacher. 3) Teacher to Students: When Keith brought Addy to school, Mrs. K. told him that she had spoken to her students the day before (while Addy was at Children’s Hospital) and given them a heads-up that Addy will look different, and she told them to all be polite. I’ll share Keith’s perspective of his morning drop-off in my next post; in the meantime, I can tell you that it worked. 4) Talk to Addy: The thing about talking to a child is that they have the attention span of a ferret, so we had lots of small conversations leading up to her laser surgery, rather than one Big One. We brought it up multiple times in various settings, making sure to be positive and graceful each time. Again, this is her 30-somethingth treatment, so she knows what happens at Children’s Hospital – it’s kindergarten we were preparing her for. We also tried to broach the subject of possible negative reactions. My mom (Nana) handled this one. “That’s right, Addy! Addy? Focus on Nana here. Yep, sometimes people are polite, sometimes they’re rude, and that’s okay. And with that, we released her back into the wild. All in all, we over-prepared her. Her classmates are kind, their parents are raising them well, her teachers handled the situation beautifully. It was almost a non-event to walk into kindergarten with a suddenly-purple face. I’ll include more from Keith’s perspective of that morning’s drop-off in an upcoming post, but for now I just wanted to share some of our ideas, in case any of you are wondering how to ‘chat’ with your own little ferret. And I’ll post more ideas over time; for now, just know that the overarching theme in any such conversation is to be positive and relaxed. Your child will absorb your attitude. So remember that life is good; talk openly, talk like they’re lucky to be special, laugh about all the reactions they may get, and mention negative reactions with grace and empathy. Today Addy went to kindergarten sporting purple laser-surgery bruising for the first time! As usual, the parents stressed more than the child. We had talked with her quite a bit leading up to this, and I’ll write a post soon to let you know what we covered and why. In the meantime (we’re all pretty wiped out from the last few days here, so I’m going to bed ASAP), I can tell you that her classmates are cool, her teachers are awesome, we love her little school, and it totally works to tap into a girl’s inner diva. For the record, I LOVE school uniforms, and think that K-12 education (and teachers’ sanity) would be greatly, immensely, immeasurably improved by widespread adoption of uniform uniforms. From the moment our little girlie-girl first “oooh”-ed and “aaah”-ed herself in the mirror (the day her stay-at-home Daddy finally dressed her in a girlie dress from Nama for a doctor’s appointment), we’ve counted on allllllllll her awesome girlie dresses to bolster her identity. In other words, her wardrobe is so fabulous that it enters the room before she does. Before her port wine stain does. And we’ve now been neutered. Because she can’t wear her myriad lovely dresses. Or her shiny, handmade headbands in her long golden hair. Or the sparkly pink shoes from Nama. Or the shiny costume jewelry from Nana. So, she brings *just* her own self to school. Without adornment or ornaments. And, go figure, she’s fine with it. Meanwhile, I’m on my third helping of cookie dough blizzard. She finally gave up; clearly, he just wasn’t getting it, so she went off to play. Addy has officially started preschool! And aside from the normal mom-isms (“how did she grow up so fast? !”), I’m wondering: how should I handle her stain? She never seems to notice it; she never talks about it at home, she’s never asked us about it. She’s very matter-of-fact when it comes up indirectly (like putting cream on that side of her face after a treatment). So… do I a) bring it up with her to pre-emptively deal with any potential classmates’ questions? Or b) do I stay mum and just wait for her to ask me? I’m mildly concerned that if I say nothing, then I’m not preparing her well; after all, I don’t want her to be suddenly surprised by a barrage of questions without warning. (Fast-forward 15 years: “You threw me to the lions that day!”) On the other hand, if I do try to prepare her (like how? role-play? she’s 3…), then am I just planting seeds of worry, making a bigger deal of it than her classmates would? When she started last Monday, I opted to stay mum. And after two days of preschool (she only goes twice a week), she still seems happy and well-adjusted. Excellent. But… should I still bring it up? After all, aren’t parents supposed to be the first ones to talk to their kids about stuff? “When they offer drugs, just say no.” “When they ask about your face, just say __.” Or does that just give the kid fodder for discussions with their therapist in 20 years?